The parents, girlfriend, and I decided to give Long Peaks a run for its money today. 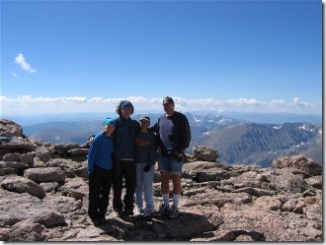 We successfully summited the 14er by 11:00 in the morning after leaving a little later than anticipated from the trail head around 4:30am. The hike was great and weather fair apart from the wind being exceptionally strong from the keyhole on through the trough and narrows. I was especially excited to do it because it gave me a chance to test out the backpack I’ll be taking to NZ. The pack worked out very well and felt like it rode on my waist for the most part and stayed off my shoulders. I gotta give credit to my Mom and Dad as well for making it to the top. There’s many people their age who wouldn’t be able to conquer the mountain, but they did, and I’m impressed. Here we are on top of the mountain at 14,256 feet! Check the Photo Gallery for pics from this trip.